In „vague de corps“, Stephanie Felber and her team question the emergence and dynamism of groups. Forms of power and empowerment, positionings and decision- making processes are negociated and balanced. The audience is not only in the role of the passive consumer. In fact, the choreography is designed as a performative gathering of bodies that dissolves the boundaries between performers and the public, as well as those between a fixed score and collective action. Choreography, light, sound and spatial design merge into a multi-sensory setting, which allows for a heightened experience of group dynamics. 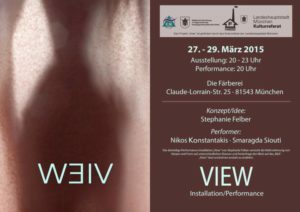 A production by Stephanie Felber, supported by the Cultural Department of the City of Munich and Tanzbüro München. The premiere was realized in coproduction with PATHOS Munich and was supported by the Cultural Department of the City of Munich. Stephanie Felber is a guest of Tanztendenz München e.V. How do we create performative situations in public space? With different choreographic modules, we turn a district into our playground and try to find out how we can shape and influence it through movement. The movements we are dealing with are above all those resulting from observations in the everyday urban environment. Here we want to fan social mechanisms of choreographic aspects. In doing so, we shed light on how the body stores and expresses it individually and within a group. „INTERLUDIUM“ wants to address the inhabitants of a selected city district, but also the daily passengers who cross or visit this district and is supposed to be „implanted“ as a temporary/mobile sculpture. A playful approach is created to counter anonymity and to show courage, humour, togetherness, fun and spontaneity. „INTERLUDIUM“ will serve as a meeting point where interaction and „games“ take place. The „games“, latent attention-actions (e.g. common loud reading, step patterns, assigning postures, transporting ordinary objects in a complex way, etc.) are carried out with the participation of passengers and inhabitants of the selected district and of two artists/performers and maybe up to 5 dancers. two performers force themselves into a sort of corset of denial of identity and slip into a rainbow skin. Through the alienation of the outward, in its appearance and movement, the unambiguous obscures itself into the ambiguous. S. Felber and N. Konstantakis break up queer codes of the visual arts by means of the performing arts and counteract these. Residential Support: Studiobühne Cologne, Tanztendenz Munich e.V. Production: Tanzbüro Munich – „Transformance CityXChange“, Tanzzentrale Region Nürnberg e. V., Tanzstelle R e. V. Regensburg, Passauer Tanztage. 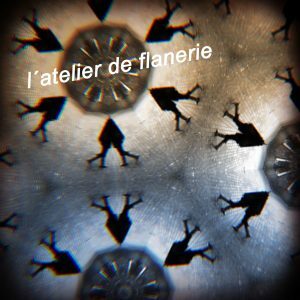 l’atelier de flanerie is a choreographic conquest of space where the audience does not become a customer but a dealer while the performers function as „psychogeographers“. A not targeted, strolling walking becomes a sensing and information tool. Here the correlations between subject, space and power structures are in focus. Stephanie Felber researches with her team in the intersections from constructed to compositionally reclaimed thoughts and movements, which are partly an installation and performative experience, usually so that the viewer is on one hand involved and also on the other hand challenged or confused by his perception. Often the intention of volatility lies behind the work. Stephanie Felber is guest of Tanztendenz e.V. „WEIV/VIEW“ deals specifically with the aspects of blurring or filtering. How is the body perceived when a attention is focused by a frame? What happens when the body and the perceptions between abstraction and concreteness oscillate? What effect does the minimization / reduction of the three- dimensional movement of a dancer by framing and filtering on the two-dimensionality? The project represents an attempt to portray the different and specific perspectives of the media used and to reflect their perception.The body or the body structure are the starting points of the work. Two bodies become one. They approach each other and they move away, they are one and the other. Is a body itself at all, is it the same as itself or is it the self. Each is the beginning of the other, each one reflects the other. A special created world, into the visitors can enter and be addressed by various visual and auditory stimuli. The arrangement of the individual media of the space itself becomes the image. The structure of the body is thereby staged. Various impressions and feelings are to be built at the visitor and to be remembered. MEDOMAI is an examination of the fluid body projections. Slowing down physically to an almost constant rhythm, and to a velocity like we see on snails perceived by our eyes, we gain time to recognize how our situation changes in every instant, as well as the relation to our partner in any aspect. We are not able to fulfill desires or to get our desires fulfilled because during exactly that time, while we understand what we could do to reach our aim, the whole situation has already changed. In the impossibility to follow decisions and previsions, and so in the incoherence of expectations, there is a fragment of undecided land, where we can be free to perceive the present and staying in the slowest motion, second by second without knowing about what will appear next. Like this we can open possibilities to let them guide the body without thoughts, but with extended awareness. This also happens in life, but only when we are surrounded by a slow space. Only there we are able to understand the process, only then we are able to sense how things are evolving. In the quickness we can arrange things in a way that we can reach our aims, in the very slow motion we can only adapt our body and our mind to the situation. Here we might find new resources, we could change ourselves and our trajectories if we wanted, most likely because of the interaction with a non average time and state and the relation to the other person.